We learned first-hand of the role metal AM might play in terms of fleet readiness and logistics during a recent discussion with John Murray, president of Concept Laser, Inc., and Rey Chu, principal, manufacturing technologies, PADT, Inc. Concept Laser and PADT recently joined forces to help prove-out the application of 3D metal printing to restore aging aircraft-engine parts. Specifically, Concept Laser and PADT worked together to reverse-engineer and print an entire exhaust stack for a WWII P-51 Mustang long-range, single-seat fighter. Working with Rob Connelly, former Proto Labs vice president of AM and owner of one of the 150 or so surviving P-51 planes, nicknamed Hurry Home Honey, Murray and Chu looked for the perfect example of a part they could reverse-engineer and print to demonstrate the value of AM. The P-51 exhaust stack—before (far left), with 34 total in. of weld seam around the racetrack-shaped base and joining the two clamshell stampings; and after, 3D-printed from Type 304 stainless-steel powder. “Printing the part,” says Concept Laser’s Murray, “eliminates the need to develop a stamping die and weld fixture.” To print the parts, they were angled at approximately 25 deg. off parallel (below) with the build plate using support structures. The original manifold was manufactured from four parts—a cast base, two stamped clamshell pieces welded together, and a cast ring. There’s a total of 34 in. of weld seam, and some of those welds exhibited quite a bit of rework, done to repair damage resulting from excessive high-temperature cycling in service. 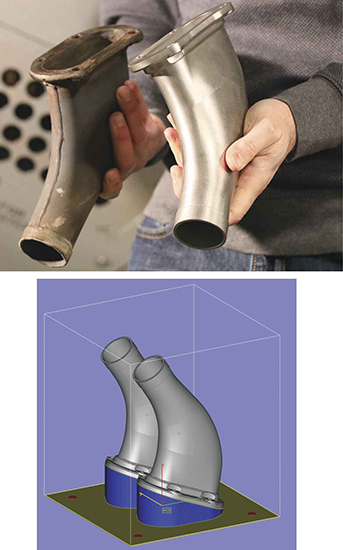 Chu and his team also performed some simulation work on the CAD model, using Ansys simulation software to study how the resulting 3D-printed exhaust stack would perform in service. They ran heat-transfer and fluid-flow analyses, “the idea being that we could, if we wanted to, modernize and optimize the design of a part to improve its performance over an original design,” Chu says. Chu then sent two STL files to Concept Laser for printing—the resulting model and a second mirror-image model. In all, Concept Laser printed four stacks, building two at a time on one of its M2 casing laser-powder-bed machines. 3D-printing one pair of stacks took two days, for a total build volume of 125,542 mm3 and a weight of 1.98 kg. For the stacks to build successfully without internal support structures, they had to be rotated approximately 25 deg. off parallel with the build plate. This resulted in a relatively large support structure under the mounting flange, which had to be added manually (using Materialise Magics data-preparation and STL-editor software). The supports on the lower flange for both pieces then were removed via CNC milling; hand tools were used to remove the extra support added to one of the upper flanges. Both exhaust stacks were then bead-blasted to enhance surface finish.